Educational advancement of young people is one of the core objectives of the Huddersfield Pakistani Community Alliance. We see education a root out of poverty, achieving social mobility and placing our generations in positions where they are able to make positive change and reform. 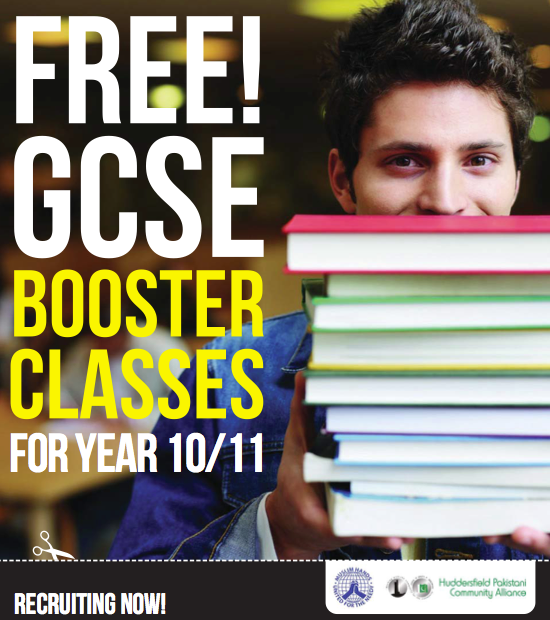 Our GCSE Booster Classes project is funded by Muslim Hands charity to support young people in year 10 & 11 studying for their GCSE's. At any given time we work with a cohort of 20 to 25 students (male/ female) primarily from educationally disadvantaged homes. Students are given help with Maths, Science and English. Already, the benefits of this additional support are there to be seen. The students are enrolled on the first come, first serve basis. At the start of each subject cohort all the young people are assessed by the tutor. These young people are also reassessed at the end of the programme to ascertain the progress. This is then measured against the progress at school.